Thin & long frilly green leaves. Sweet & earthy licorice flavor. Pairs perfectly with fish & pork. Great fall garnish! 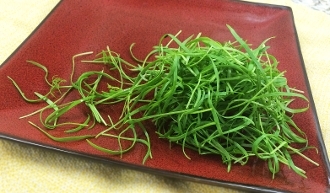 Unique herb that can be added to roasted apples, a winter salad or used as a beautiful topping for soup.